Good question Eric but regrettably easy to answer. No it would not change UK foreign policy to any significant degree, and the reason has nothing to do with Jeremy Corbyn – an honourable man – but with limitations not confined to Britain’s Labour Party but to parliamentary socialism itself. Nowhere are those limitations more in evidence than in foreign policy. There is too much at stake, given (a) Wall Street’s need – hence Washington’s – to demonise your country and (b) the British ruling class’s need (for the foreseeable future) to stick with its ‘special relationship’ across the pond, for any UK government to strike a truly independent note here. Some will recall the 1997 Labour Party’s return to office, after thirteen tory years, with a commitment to ‘ethical foreign policy’. That commitment swiftly ran aground: initially in pathos when Foreign Secretary Robin Cook resigned in disgust at being constantly undermined by number ten, then in farce as Blair called time – in a fiat without precedent – on a costly police investigation into arms company bribes to the House of Saud. In short, parliamentary democracy is largely illusory. That’s why I’ve referred twice in this post to office rather than power. They aren’t the same but there’s nuance here – which is why I say largely illusory, and that brings me to the secondary aspect of your question: “… or is it like the US – an effective one party state, at least as regards foreign policy”. Corbyn’s victory poses a real headache for neoliberal rulers who – turning a 2008 crisis of their own making into an ideological asset – grew richer in absolute terms, and richer still in relative terms, through years of attacks on wages, job security and public infrastructure in the name of austerity. That victory shows that while parliamentary democratic fundamentals are the same the world over, secondary differences matter. As the fate of a Bernie well to the right of Jezza shows, Corbyn could never have won the leadership of the Democrats. In sum we need calibration in these matters. Was Marx right? Yes – as he so often is. Is Britain a one-party state? Not quite, not yet. But that’s slender consolation for a Russia which in my view has bent over backwards to pursue good relations with the West. And if years of being rebuffed in those efforts have served only to throw it into deepening ties with Beijing, well, some of us in the West know where the blame lies. A very legitimate question Eric posed and I suspect a quite clever observation which you have confirmed and he already knew the answer to. I’m not a devotee of Marx(only the basic tenets of the socialist core ethos)but Marx, as you say, was very critical of the state apparatus being simply a replacement of the current right wing, capitalist trend when used the way TPTB apply it. Many thanks for your reply to Eric. Eric isn’t a Marxist either, Susan. By the way, I don’t know any who consider themselves devotees of the man. I find his analysis of capitalism second to none but that makes me a (critical) Marxist not a devotee. Contrary to a misconception most useful to those with a stake in ridiculing critiques of a world order that threatens all of us, we’re not talking Baghwan or Maharishi here! But that’s by the by. 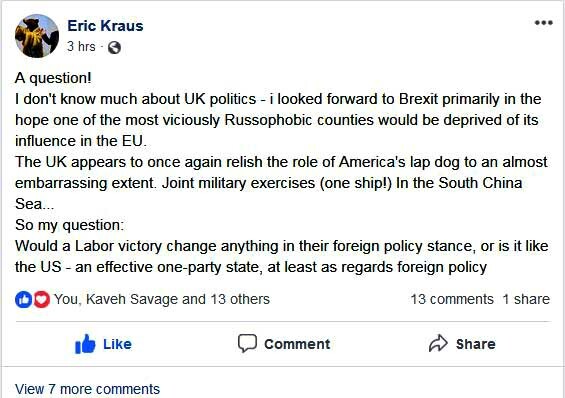 Since I wrote this post I’ve had two significant exchanges – one with Eric Kraus, the other with our mutual friend Roger (“Socialist in Canada”) Annis – and aim to write a follow up, offering a more nuanced assessment of parliamentary democracy and the British Labour Party, of which I am a fully paid up member. My convictions on the empty illusion of a ‘parliamentary road to socialism’ do not lead me to reject Labour as good for nothing. It remains a vital if inadequate and frequently treacherous force for defending workers and civilised values both. What’s more, I was thrilled by the Corbyn phenomenon. Not because it changed fundamentally my views as set out here and in the post, but because after years of silence and unfocused anger – misread by TPTB and liberal media as glum consensus – JC’s against-the-odds wins gave focus to a rage and suffering which hitherto had no outlet, no form of expression or representation. It strikes me that the ‘non politics’ of liberal democracies in the West following the limited, but real post World War 2 concessions to the working class is fast approaching its sell by date, undermined as it inevitably will be by the failure of capitalism to provide a modicum of equality in developed countries and its absolute exploitation of the global South. These are interesting times for parliamentary democracies – there is always the potential for progressive change but also the threat of undisguised oppression as ‘real politics’ break out again. Needless to say Bryan I agree with the assessment of your first paragraph, and share the fears of your second.